Celebrate the launch of the “Stupid Boy in an Ugly Town” music video! After a successful Kickstarter campaign in the spring, East Vancouver folk singer-songwriter Rodney DeCroo and students from the Templeton Secondary School After School Film Program are excited to share their work. Collaborating with mentors Flick Harrison (filmmaker) and Rebecca Blissett (photographer, videographer), the students and DeCroo wrote, directed and produced the music video together. 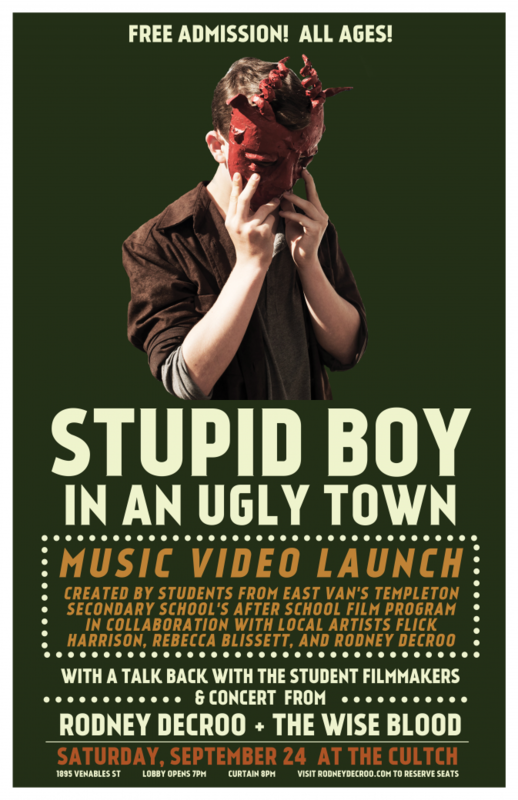 This is the screening event for the “Stupid Boy in an Ugly Town” music video with a talk back with the student filmmakers and a concert from Rodney DeCroo + The Wise Blood. Share this event with your friends here!